Typically it is a project manager or a director who is aware of when and how much to invoice a client. eTrack thus separates the preparation of invoices from the printing and tracking of invoices into two separate screens. Protected by tight security, eTrack allows managers to view charges and margins, optionally enter write-offs and adjustments, and prepare invoices. The Account Sheet is the interface between fixed quotes and timesheets and invoicing. It is an intuitive journal of transactions and used by companies to accurately prepare thousands of invoices. Viewing budget status of fixed price, time based, percentage based or lump sum work. Viewing timesheet entries and expenses at all levels (see expanded tree in picture). Entering Invoices $ or as a percentage. Prebill in advance and optionally auto decrement the prebill amount as more time is entered. Creating and monitoring Fee Schedules or payment plans. Monitoring WIP, charges, costs, profit to date and forecast profit. Print or Export to accounting systems. Manager views all projects they are responsible for in one click. View WIP $ to see how much can be invoiced. Write-Off time or expenses not to be invoiced. Create Adjustments for fees in advance such as contracted out work that is complete but not yet received an invoice for. Create a new Invoice Entry and enter an Invoice Amount (typically equal to the WIP if time based work or a % of the Fixed Price work). 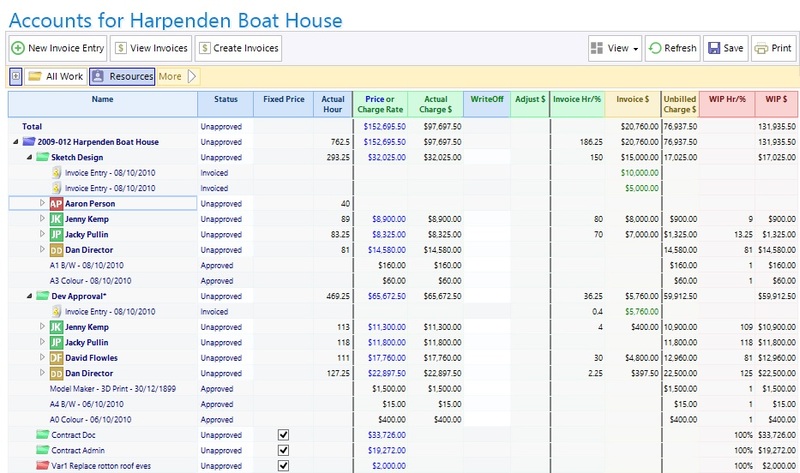 In larger companies a director may filter to view prepared Invoices for final approval. Click Create Invoices button to view the Invoices in the Invoice tab where they can be printed using customer templates, emailed and payments tracked.